Our vision is for natural resources to benefit all genders equally. The mismanagement of natural resources highlights and, in many cases, fuels inequality. In turn, gender inequality fuels insecurity and human rights violations. We aim to understand how gender discrimination occurs in natural resource management systems and the opportunities for transformation and empowerment in areas where security and human rights are at risk. While we may often speak of addressing the needs of women, girls, men, and boys—our definition of gender goes beyond the exclusive labels of “male” and “female” and includes all gender identities. What do we mean by gender equality? Women and men will enjoy the same rights and opportunities, including the right to access, to control, and to benefit from the natural resources in their communities. We seek to deepen our understanding of how natural resource management affects women and men, girls and boys, differently. We also look at the impacts of this inequality, including on security and human rights. We analyze how roles are assigned to specific genders, as well as the issues of ownership, control, and management of natural resources to identify who benefits and how and to pinpoint opportunities for empowering those who are deprived of these benefits. We develop innovative approaches to integrate gender equality into natural resource management systems in areas where security and human rights are at risk. We undertake sensitization and outreach to improve understanding of gender equality and women’s rights, including the right of women to access, control, and benefit from natural resources. We foster women’s leadership opportunities, providing skill-building and training. We provide technical guidance and capacity building for gender equality to be integrated across all natural resource management systems, in support of policymakers, the private sector, and communities. We advance multi-stakeholder dialogue to promote gender equality in the natural resource sector by sharing the findings of our research and approaches, as well as policy and programming recommendations. 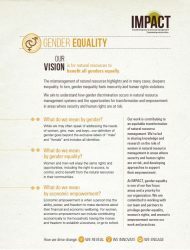 This document provides an overview of our work on gender equality, including specific projects and other efforts to ensure that gender equality is part of natural resources management. Also available in Spanish.